Nowadays, IT infrastructure plays an important role in business and without a well-established foundation there is little chance for succeeding in the long run. Some may believe that creating a stable foundation is expensive. Although it may not be the lowest amount you’ll ever pay, it is money well-spent, which can definitely be kept within reasonable boundaries. Having brand new equipment is great, but far from vital. So, instead of spending a fortune, try optimizing your IT infrastructure. Every business is different and what works for one may not work for another. Therefore, you should think about the workload and its complexity, when deciding on the number of staff you need in your IT department. However, ideal size does not only include staff, it also relates to the build-up of your network. Finding the right server-workstation ratio is important, if your infrastructure is to function without frequent flaws. According to TechRadar, “for most businesses a ratio of one server to 10 users is about right.” So if you have 10 workstations, get 2 servers, so that there is a backup, if needed. Evidently, it’s not only size that matters. You should also keep in mind the diversity of your platforms. In order to avoid sleepless nights caused by a complete shutdown, it is wise to use both PC and Macs as workstations. Once you have ticked all the boxes, you just need to make it fast. Choosing your hardware and software correctly is a huge part of escaping slowdowns. The rule is to spend around 20% of the server costs on decent networking equipment. Building a modern and well-functioning IT infrastructure can be difficult, but there are many great guides. 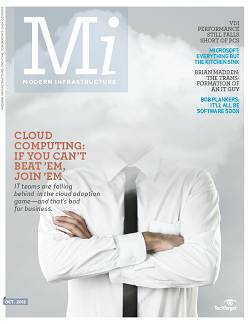 For more tips on IT infrastructure check out Modern Infrastructure by TechTarget.